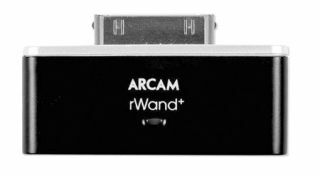 Arcam cuts the cost of its rWand+ dongle | What Hi-Fi? Following a recent price cut on its rCube iPod dock, Arcam has now also reduced the cost of its rWand+ iPod dongle from £70 to £50. The rWand+ streams lossless music using Kleer technology to up to four rCubes or rDACs-kw and works in tandem with the new rWand+ iPhone app. The app handles pairing and association of devices and allows the user to direct the iPhone/iPad signal to up to four rCubes or wireless DACs. Individual devices can be named according to which room they're in ie: Kitchen rCube, Living Room rCube and so on (see above). Arcam's rWave USB wireless music streaming dongle for PCs and Macs is £80.